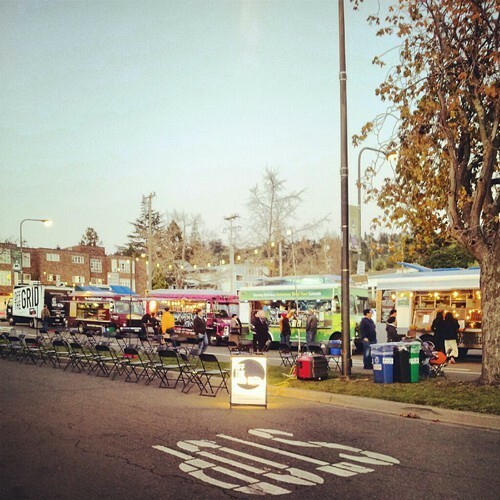 In what is perhaps a temporary blow to the East Bay’s mobile food revolution, the North Berkeley offshoot of Off the Grid — the series of wildly popular weekly food truck gatherings — says goodbye tonight. A press release issued today announced that this evening’s Off the Grid event — which was scheduled, as usual, for 5 p.m. to 8 p.m., at the intersection of Rose St. and Shattuck Ave. — will be the last one ever at that location. The reason for the sudden change in plans? Matt Cohen, Off the Grid’s proprietor, told me the North Shattuck Association has long wanted to reconfigure the space where the North Shattuck Off the Grid market takes place, and it’s been granted a permit to begin that process early next year. The upshot is that the site won’t be accessible for a period of time, and — once the construction is completed — the amount of space that would be available for Off the Grid to use would be reduced by about half. As a result of that conflict, the City of Berkeley decided it wouldn’t make sense to reissue the mobile food gathering’s permit for 2013. And so the North Berkeley Off the Grid is on hold indefinitely — at least until Cohen and company can find a new location that works for everyone. For his part, Cohen is optimistic that he’ll be able to find such a spot without having to leave North Berkeley altogether. According to the press release, about 1,500 customers routinely visited the North Berkeley food truck gathering each week during the year and a half it was open. Meanwhile, as of this posting, the North Shattuck event will still be open for another hour tonight. The lineup of trucks: Koja Kitchen, Señor Sisig, Go Streatery, Lil Green Cyclo, Brass Knuckle, Sunrise Deli, Roli Roti, FiveTenBurger, The Chairman, and CupKates. If you’re feeling sentimental (or just hungry), there’s still a little bit of time to swing by and say goodbye, or at least buy one last pork bun or fancy taco.